A pre-screening service that lets students receive medical help as quickly as possible. 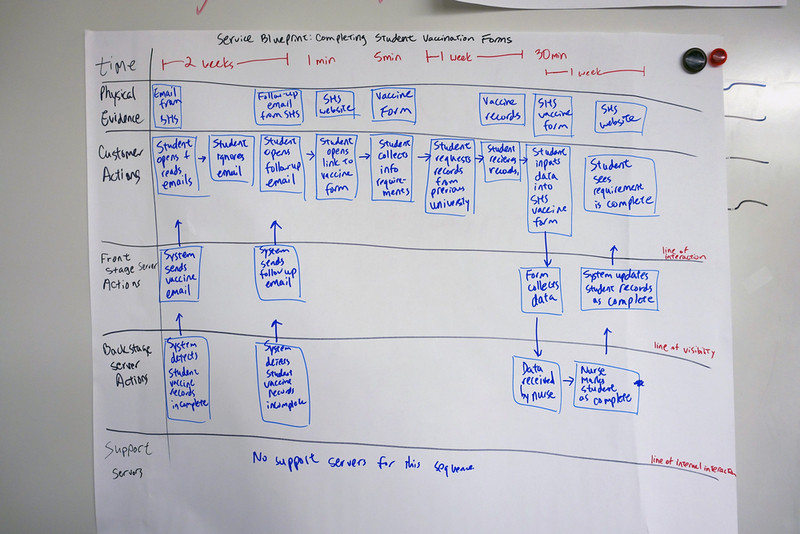 Case study focus: Quantitative and qualitative research, flow models, visioning, and service design. Part of the final poster that for Nursechat that we presented to UHS. Problem: Currently, many students attending Carnegie Mellon University do not tend to think about their health until they get sick. When sick, many students would not bother looking up their symptoms or pre-screening to see what their illness is. As a result, CMU's University's Health Services (UHS) has a backlog of student's who cannot be seen for weeks due to many appointments that end in frustration as many of the appointments are by students who have either common illnesses that can be cured by over-the-counter medicines, or are too severe for UHS to treat. We set out to improve the delivery of services and help students achieve better health. Solution: After conducting various research techniques, we designed NurseChat, a professionally crowdsourced, personalized, pre-screening online service that helps users learn what their symptoms are, if UHS has the capability to help them, and connects students with a nurse that could give them advice on what to do until the time of their appointment. We interviewed several CMU students about their general health practices and their experiences at UHS. We found many students do not know UHS's hours of operation, or understand what services they offer. Students went to UHS several times and their symptoms were not sufficiently treated. Many students had trouble scheduling appointment dates within a reasonable time period, sometimes waiting weeks in advance. We created an Affinity Diagram to document our observations and grouped our findings. Students felt UHS did not care about them. To further investigate the issues we observed in our data, we created service blueprints and flow, sequence, and cultural models. Together, these large amount of appointments were draining UHS's ability to treat as many students as effectively. We addressed many of the key issues in our process of trying to create design solutions for the problem. Our visions varied across the multiple key problems that were found in our data. After going through the process of visioning, we made a number of storyboards, ran users through them, and analyzed their reaction to each idea. All of those interviewed said they would use the online doctor in the storyboard, but not for a full doctor visit/checkup, which led us to re-imagine and visualize the tool as a pre-screening method to help patients learn more about what their symptoms and what their condition is. Visioning Inspiration for NurseChat -- a bit more exaggerated than how the real world works. NurseChat Ideated from a visioning session storyboard where student's could interact face to face with an online doctor. From our models and affinity's data, we designed NurseChat. The creation of an optional, professionally crowdsourced, pre-screening service helps students be proactive about their health and to understand what UHS is capable of in terms of treating their symptoms. This system helps reduce patient waiting times and helps them get the care they need, while also aiding UHS freeing up their personnel to treat students with illnesses that they can help cure.